The building looks innocent enough, with the large windows and the promise of sales and bargains inside. 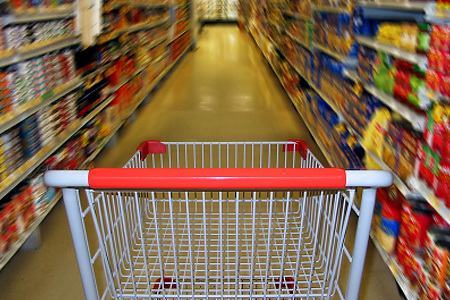 However, the grocery store can be a dangerous maze for people to navigate when they are trying to lose some weight. It is important that the intrepid explorers who visit the supermarket know how to make their way through the treacherous aisles without succumbing to the fate that befalls so many other innocent shoppers. It is possible, but it will take preparation. Here are a few things that will help you. Before you even step outside your house, you will want to make a grocery list. It doesn't matter if you make the list on your smart phone or a piece of paper, but you need to write down everything that you need from the store. You do not want to have to spend time wandering around the store and trying to remember if you need to buy mustard or milk. If you have been to this particular store before, you will have a good idea of the layout. When you are making your list, try to write down what you need aisle by aisle so you do not have to do too much back and forth through the store. Too much time wandering means that you are more likely to come across some tempting foods! The grocery store has some dangerous foods, there's no doubt about that. You will need to avoid some of the sections entirely if you are going to get out of the store without a cart riddled with potato chips, candy, ice cream and soda. Another tip that will help you stay safe on your trip is to have a healthy meal before you leave for the store. If you don't have time for a full meal before you go, then make sure that you at least have some type of snack. A handful of raisins and nuts is enough to stave off the hunger when you are in the store. If you go into the store hungry, you are more likely to buy junk food that you do not need. Another option is to head to the store after a workout. You will feel euphoric from the workout and you will be less likely to start buying unhealthy food. Knowing what you need and going in with a full stomach is a great way to prepare. Now that you are in the grocery store, make sure that you have your list with you. Start on one side of the store and make your way across, checking off the items as you buy them. Do not spend too long standing in one aisle because it can prompt you to buy things that you don’t need. Once you have your items head to the checkout line. Make sure you keep your eyes off all of those impulse purchases at the counter. They are full of candy, so you will want to stay strong. Now that you know how to get through the grocery store without piling your cart full of all of those calorie-filled, unhealthy foods, it doesn't seem like such a scary place!